The wide tire revolution started here. We tested dozens of tires on real roads, with a rider on board. We found that much of what we believed about tire performance was wrong: Higher pressures don’t make tires faster. Wider tires roll faster than narrow ones. Tires make the biggest difference in your bike’s performance. 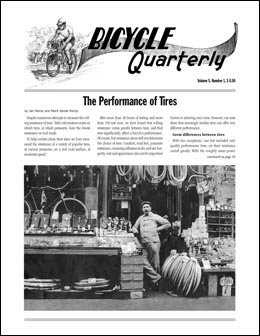 To emphasize that the magazine no longer dealt only with cycling history, we changed the name to Bicycle Quarterly, dropping the Vintage. But then we went straight back to cycling history, with a feature on the fascinating Reyhands, the pioneers of the modern constructeur bikes. We feature two exceptional women’s Reyhands from the 1930s and bring you the story of a female rider on a Reyhand in the 1937 Technical Trials. In the Randonneuring Basics series, we look at how to make your bike faster. Is it better to reduce the weight, improve the aerodynamics, or change the tires. Kent Peterson provides a counterpoint and writes that speed isn’t the only goal in a long-distance ride. Our test bike is a 650B titanium road bike that presages the future.